On this trek, we can appreciate a progression of the diverse types of ecological zones from subtropical through puna to glacier peak of magnificent Salkantay mountain (6271m/20569feet), finally arriving to Aguas Calientes, where we spend the night in a comfortable hostel . On the last day of the tour, we take a tour of the magnificant ruins of Machu Picchu. Conquer one of the most famous treks to Machu Picchu,discover the Inca buildings,visit Quechua communities y Capture the best moments of your life! Location: The Salkantay trek begins 3 hours drive west of Cusco. We pass the village of Mollepata and begin hiking at Challacancha. We will leave Cusco at 5:00 a.m. and take a three hour bus ride to Mollepata. Upon arrival we will meet our horsemen for the journey. After walking three hours we will arrive at Markoccasa, lunch, and rest for an hour before beginning our walk to Soraypampa. In this part of the trek we will be able to see just ahead of us the first snow cape of Huamantay in its entire splendor. Here, our crew will meet us with cups of hot Coca tea and shortly afterwards, dinner. Return train ticket to Cusco. BOOK THE FAMOUS SALKANTAY TREK TO MACHU PICCHU AND GET ENJOY A FREE CITY TOUR OF CUSCO! How Far In Advance Do I Need To Make Salkantay Treks Reservation? 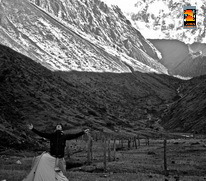 Salkantay Trek permits are not required for this trek so in theory you could just turn up in Cusco and book this trek a day or two in advance. However the train tickets from Aguas Calientes and back to Ollantaytambo at the end of the trek are becoming more and more difficult for us to purchase at short notice and it is highly recommended that these tickets are bought at least 2 months before trek departure. The number of spaces within the group are also limited so if you have limited time in Cusco and you really want to do this trek then we would recommend making a trek booking as far in advance as possible. For an average travelers or hikers, Salkantay is considered a challenging but certainly not impossible hike. Due to the physical demands, anyone who wishes to trek Salkantay should at least be moderately fit. 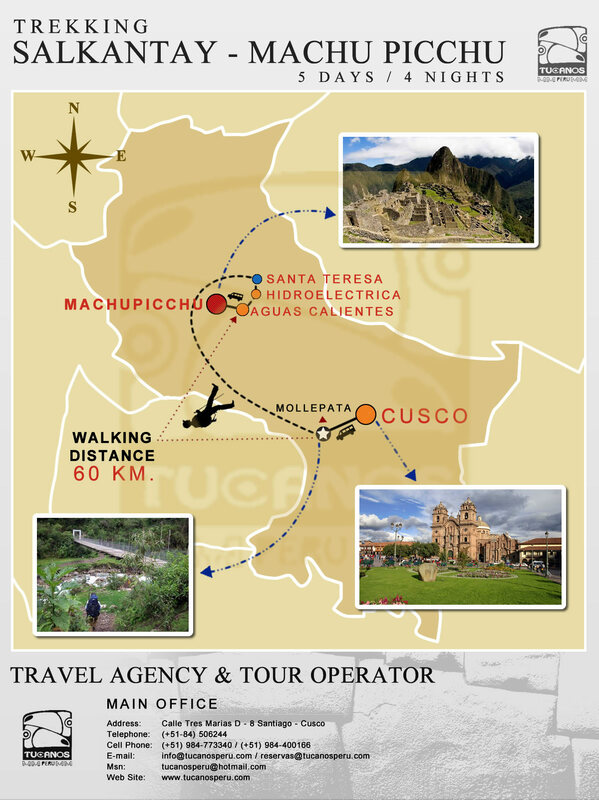 Plus, all trekkers should spend at least 2 days in Cuzco before the trek, to get acclimatized. Being extremely fit does not grant any immunity from altitude sickness. The amount you walk each day varies. An average day is 6-7 hours. What’s The Most Challenging Section Of The Hike? The Salkantay Pass, at approximately 4,600 meters above sea level is the most difficult section in the trail. These challenges are a result of several factors: the challenge of uphill climbing, bitter cold winds, low temperatures in general, and the fact that you are trekking at a low-oxygen altitude. 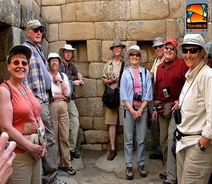 Tucanos Peru operates small groups and offers a personalized itineraries service. 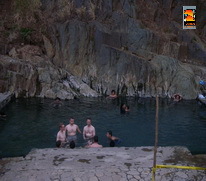 Our groups are between 2-8 persons. What Happens If I Get Sick On Salkantay Trek? We will evaluate your symptoms and treat you accordingly. We carry basic medical supplies on the trail, however, we recommend that you also bring your own supply of medicine. 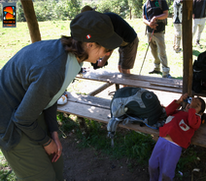 If your symptoms are considered poor enough for you to continue the trek, we will have a porter accompany you back to Cusco where you can seek further medical treatment. If you are feeling better, we will help you get to Aguas Calientes so you can participate in the guided tour of Machu Picchu. What Is The Weather Like On The Salkantay Trek During The Year? What Do We Do For Water Along The Salkantay Trek? You'll come across several mountain springs, fountains or small streams along the trail where you can fill up your water bottle. Although the water looks clean, it is always safer to use sterilizing tablets or a water filter. With these tablets you have to wait between 30 and 40 minutes before drinking. Bottled mineral water can also be taken from Cusco or bought at Mollepata or Santa Teresa. Are There Bathrooms During The Trek/Washing Facilities Like? Your camp team will provide washing bowls of warm water as you arrive at camp at the end of the day's trekking. Take plenty of toilet paper with you, and antiseptic wipes / anti-bacterial hand gel. We use the money from your deposit to make several important purchases, including the entrance fee to Salkantay, the entrance fee to Machu Picchu, bus tickets, and train tickets. In addition, making a deposit assures us that you will be coming on the trek, and are unlikely to cancel at the last minute. This helps us with knowing how much food to buy, how many of our guides to use for the trek, etc. The deposit is non-refundable once we receive it, because we will immediately use it to purchase the tickets mentioned above. Each reservation needs 25% of deposit as first payment. The final balance (75%) will be paid in Cusco. Should I Request An Extra Horse? It is better to request a horse before you go on the trail rather than realize halfway through that you’re not enjoying carrying your pack at this altitude and want some help. Additional horses are just to carry load. What Do I Need To Bring On The Trek?